Ahhh, the weekend–why over so soon? I don’t know about you guys, but I had a fantastic one. Some yard work, baking cupcakes for coworkers’ birthdays this week, Big Lick Beertopia on Saturday, a hike with friends today–couldn’t get much nicer. Also nice, discovering that I have enough recipes & reviews in the pipeline to last through the end of the month! Insanity! For this week’s SSFC, I figured I might as well make something that would last longer than just a dinner, something that would last a lunch or two (or maybe even three) into the week so that I could focus on other things than cooking when I get home from work. As much as I live for food, sometimes there are other things that have to get done & it looks like this week might be a doozy. At market this weekend, I went all out and filled my bags with everything from strawberries & cherries to kale out the wazoo (for green smoothies), mushrooms, squash, and salad mixings. With such a bounty of produce, the best way to honor it seemed to be a stir-fry full of farm-fresh vegetables, a simple sauce, and a whole grain instead of rice. With produce from all over the New River Valley, the stir-fry was a cornucopia of what’s in season right now–onions, mushrooms, snap peas, pak choi, mushrooms, broccoli, purple scallions. With a quick stir-fry sauce featuring fresh orange juice and zest, the vegetables popped with fresh, early summer flavor and the millet provided a soft grain to scoop up with the stir-fry. Why order take-out when you can make something so simple and fresh in under thirty minutes? Rinse the millet and place in a medium sauce pan. Add the water, cover, and bring to a boil. Lower the heat to a low simmer and cook for 20-30 minutes until the water has evaporate and the millet is fluffy like rice. Turn off the heat and let sit, covered, for at least 10 minutes before serving. Add all sauce ingredients in a small bowl and whisk to combine. Adjust flavors as necessary. Before beginning to stir-fry, make sure you have all of your vegetables washed, chopped, and set aside in individual bowls. Warm two tablespoons of oil in a wok over medium-high heat. Once hot, add the onion slices and saute for 2-3 minutes, until translucent. Add the broccoli and snap peas, stir to combine, add 1-2 tbsp of water to to the wok, and cover with a large pot lid to steam. Let the vegetables steam for 3-4 minutes, until the broccoli looks mostly cooked. Add the mushrooms, pak choi, and garlic and stir fry for another 2-3 minutes until the pak choi leaves have wilted. Add the sauce, cook another minute. Remove from heat, garnish with the sliced scallions, and serve with the millet. yay millet!! might be my favorite grain right now:) Thanks for sharing! 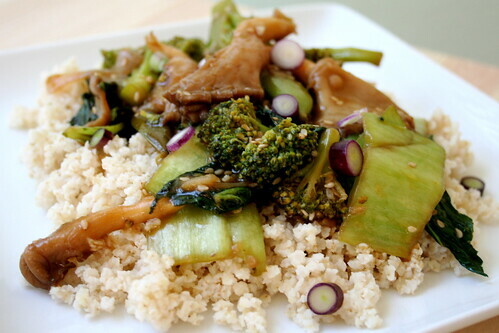 your stir fry looks amazing! Lovely dish! The flavors in the sauce sound amazing! You’ve inspired me to make some homemade “take-out” soon! Oh, fantastic. I definitely know what I’m doing with my (not so farm fresh) vegetables in the fridge! Thanks for the inspiration. I always forget how easy stir fries are. That looks fantastic. I hope you had enough left-overs for your 2-3 meals. I am not sure it would have made it that far in our house. Beautiful spring stir-fry, Jes! I just made a pasta primavera using almost the same ingredients. I love your sauce recipe and will have to give it a try. Sounds like you had a great weekend! Your stir-fry looks delicious. I can see making this myself with the different veggies that come in season throughout the summer. Looks delicious! I received a new wok just this weekend and have had stir-fry on my mind – I may follow your cue and use millet instead of brown rice. I must try the millet! 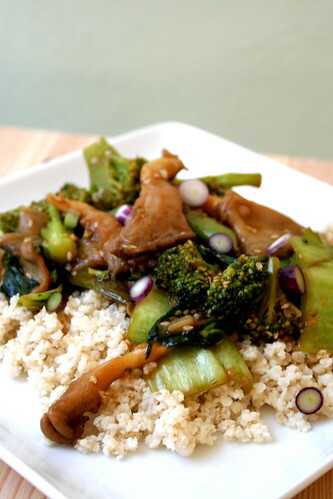 And there is nothing like a stir fry to take advantage of all those great veggies! And your weekend sounded great. Hope this week goes smoothly! That looks way better than any takeout I can get around here. Plus, I seriously love the idea of pairing it with millet! I don’t know why, but I never thought of it. Love the use of millet! And everything looks so fresh, delicious, and in-season (except the oyster mushrooms, which look creepy, but that’s just me ).